CAN'T DECIDE? Compare NUU speakers and pick your perfect match. E-mails will be answered within 1 business day. Want big sound? You want the Wake. Two woofers, two tweeters. 50W of face-blasting audial fury. The Wake waterproof speaker is so powerful you can use it to charge your other devices, even when it’s running on battery power. Yet it’s still remarkably light — under 3 lbs., or less than a half-gallon of milk. So what are you waiting for? Grab the Wake and go. Dunk it underwater (3ft/1m) for up to 30 minutes. Bury it in sand. It’ll be fine. With its sturdy housing, protective rubber casing, and integrated handle, the Wake is extremely durable and built to handle the toughest environments. By meeting IP57 standards Wake is able to float, so you don’t need to worry about knocking it into the pool or of f the boat and watching it sink to the bottom. The Wake allows you to wirelessly connect to any Bluetooth enabled device, such as phones - both iPhones and Android - iPad, tablets, and laptops. Stream your music for up to 7 hours with the Wake's built-in rechargeable Li-ion battery. Charger your phone or mobile device with the Wake's USB power port, even if it's running on battery power. *Meets or exceeds 3ft/1m drop test standards. 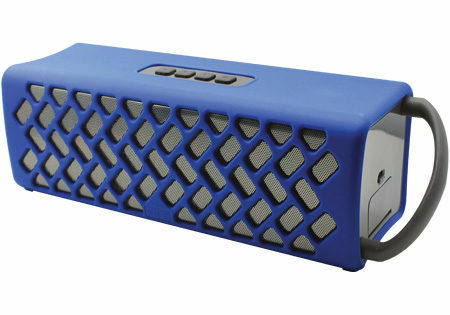 **Using the AUX-IN renders NUU speakers no longer waterproof or sand resistant. Dimensions: 13 x 4.3 x 4 in. Compare NUU speakers and pick your perfect match.